Question: Hi. I want to know what a normal hairline should look like for a 25 year old? I think I have thinning edges but can’t decide if it’s just my natural hairline or if I’m starting to have a receding hairline. My dad is balding but he’s in his 50s so I guess it’s normal for him. Answer: Hi, Christian. The simple answer is that there is no defined ideal as to what a man’s hairline should look like at any specific age as we are all unique! Some men may have straight hairlines or a high forehead, others may have a natural widow’s peak whilst others develop a more rounded hairline following puberty, known as a maturing hairline. These are all different hairline shapes and do not necessarily indicate hair loss. 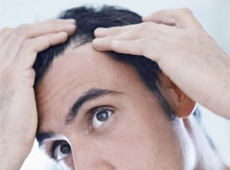 It is common for men to develop thinning hair due to Male Pattern Baldness in their late 20s and early 30s if not before. According to frequently quoted hair loss statistics, 40 per cent of men will have noticeable shedding by the time they are 35. However, it is important to note that this does not apply to all men – only those with an active genetic predisposition that makes them sensitive to the testosterone byproduct dihydrotestosterone (DHT). 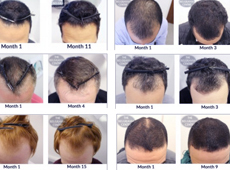 In cases of male pattern baldness, DHT binds to the hair follicles around the top of the scalp and hairline only – the back and sides are not affected – and slowly destroys them. This leads to an outward display of thinning hair and can happen in one, two or all three key areas of attach: the crown, the vertex (along the top of the scalp) and the hairline. The rate of shedding is often quite gradual and it is believed that men can experience a significant drop in hair density of up to 50 per cent before even realising there is a problem – but, again, this differs from person to person. If you are starting to notice thinning edges but no hair loss from elsewhere on the scalp, this could well be the start of a receding hairline, especially as you mention that your father is also losing his hair and this is an hereditary condition. If it is not yet obvious then you could monitor it for three to six months to see how it develops, or, if you would like to put your mind at rest now, we recommend having a professional consultation. A hair loss specialist will assess you and explain their diagnosis before recommending a customised hair loss treatment plan tailored to your specific needs and featuring clinically-proven medications that can help to prevent further shedding and promote regrowth. 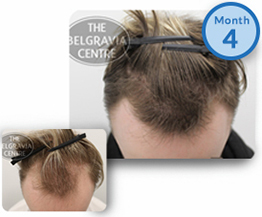 They can answer your queries and give advice on how to best help your hairline, from the use of high strength minoxidil applied directly to the temples – something our experts have found particularly beneficial on stubborn areas such as the hairline which is the slowest area of hair to regrow – to appropriate hair growth boosters to use at home.